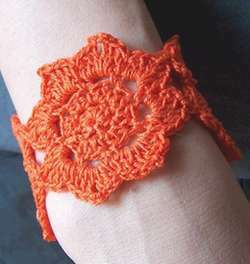 This beautiful crocheted cuff, or bracelet, is delicate, feminine and the work of talented Italian designer from creativeyarn.blogspot.com. To create this pattern, she changed up a previous Flower Applique design that she made for this Crocheted Headband. Ch 3, join to make ring with sl st. Round 1: ch2 (count as hdc), 7 hdc in ring, sl st to second ch of beg. ch2. Round 4: *3 dc in next ch3 loop, ch2, 3 dc in same ch3 loop, sc in next sc*. Repeat from * around, ending with sl st to previous joining st.
Each Flower should measure 5.00cm in diameter. Sew two petals of each flower, with two other petals. Sew two small beads or buttons on the two petals of one of the flowers at the edge. Your cuff should look like the photo at right. Now attach yarn in the ch2 space of one petal of the other edge from beads. Ch 11, sl st on the 8th ch from hook, ch3 and sl st on the same ch2 space of the petal. Work the same for the other petal opposite to the buttons. I’m so sorry if my English sometimes is not so clear, but this project is easier to make than to explain! Ciao! Licensed by Creative Commons Attribution-Noncommercial-No Derivative Works 3.0 Unported.